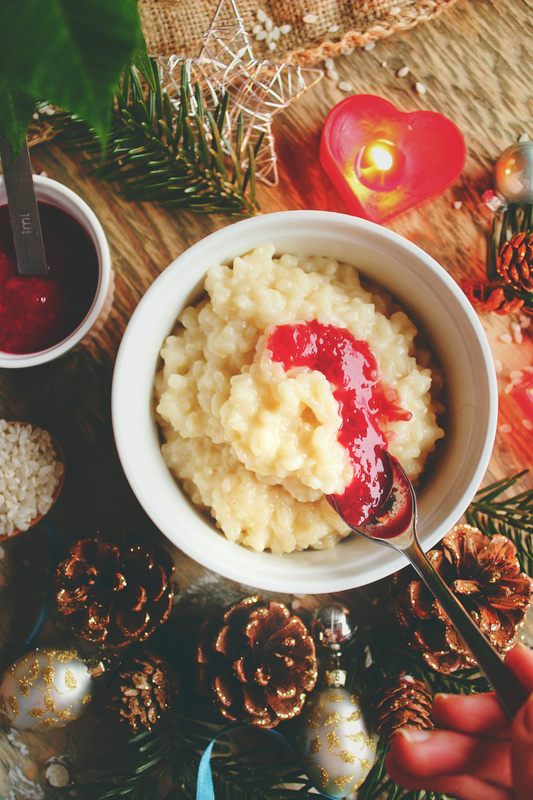 Risengrød is a Scandinavian dish eaten during December, close to Christmas. This vegan version is made with just 3 ingredients; short grain white rice, salt, and rice milk, and I have a non-traditional serving suggestion bursting with flavour for you. It’s classic Danish comfort food, maybe not so healthy, but creamy, dreamy, and gluten-free! Risengrød is good old, traditional Danish comfort food, but it’s typically made with whole milk. So the only obstacle was finding a substitute for that. The first time I made vegan risengrød, I followed a recipe by another blogger who suggested using rice milk. And it works very well! I have had risengrød since I was young. My brother and I have always loved it, it was one of our, and is still one of his, favourite meals. We would have 3, 4, sometimes even 5 portions (that was mostly my brother, though) for dinner, savouring each mouthful. Even though I’m now an advocate for eating mainly whole foods, and I’m not exactly a traditionalist, I do enjoy having risengrød every once in a while, just because it reminds me of those happy memories from my early childhood. 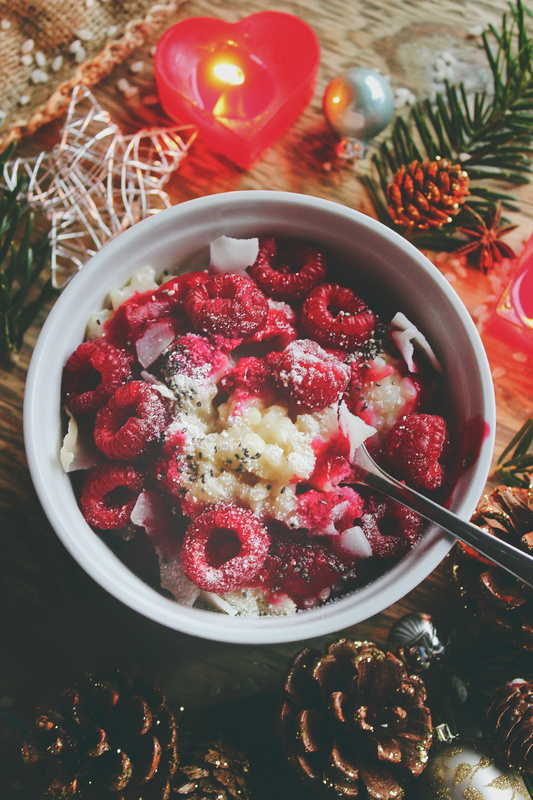 And risengrød is not only a-not-so-healthy dinner enjoyed by many Danes during December, it’s also what Danish elves eat. It’s even mentioned in multiple Christmas songs. 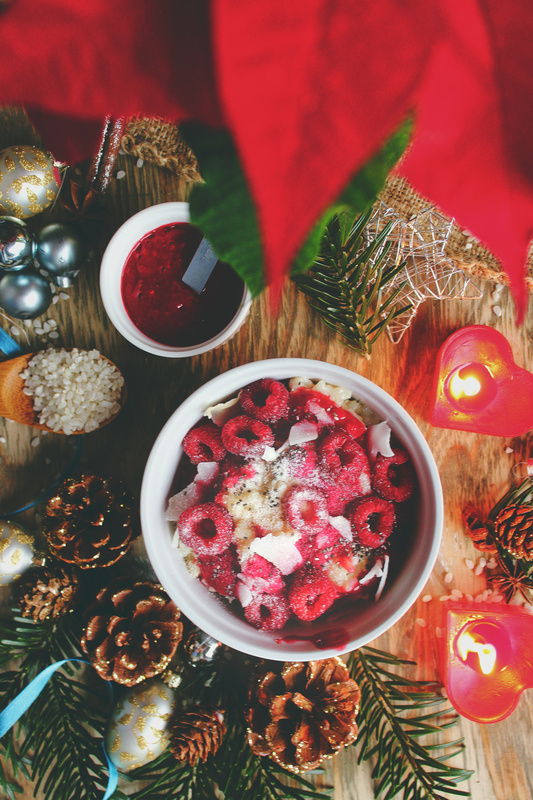 One song’s first line goes, “På loftet sidder nissen med sin julegrød, sin julegrød, så god og sød (in the attic, the elf sits with his Christmas porridge, his Christmas porridge, so good and sweet)” . And now that we’ve covered the food… let’s talk photography quickly. I wanted this photoshoot to radiate major Christmas vibes, so I tried my best decorating it in true Christmas spirit. I found an amazing blanket in the basement which I was so excited about. And I’m mostly happy about how the pictures turned out! Short grain white rice: I don’t have any substitute to recommend for these. 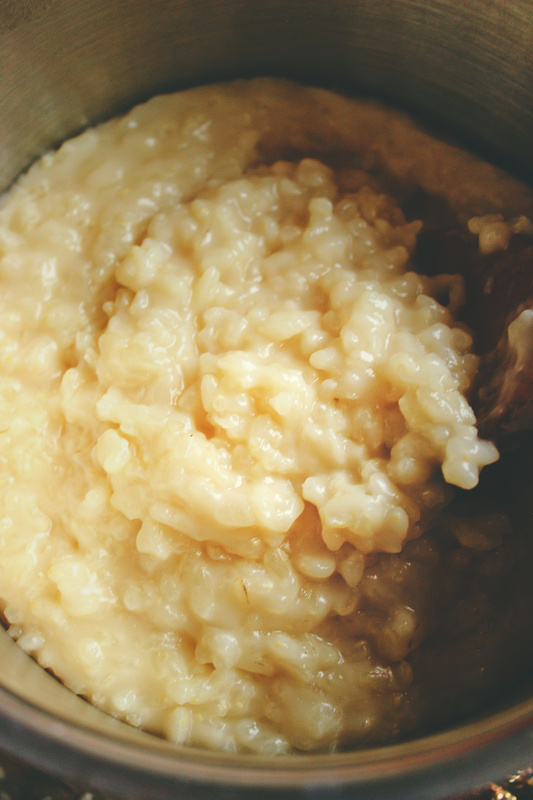 The short grain white rice absorb the milk very well, they are what makes the porridge so creamy. I have seen short grain brown rice (which I want to experiment with next Christmas! ), and I know you can make porridge with regular rice, but this kind works best to make risengrød as I have had it since I was young. Rice milk: I have only made risengrød with rice milk as I have read elsewhere that this is the best plant milk for this purpose, but I do think that you can substitute it for another plant milk, although because rice milk is naturally sweet, you might want to sweeten your porridge with something else, such as maple syrup. It’s very important that you stir very frequently as the rice milk is coming to a boil, and that you keep stirring every 5 minutes or so while the risengrød is simmering. Any milk will quickly burn to the bottom of the pot if you don’t do this. The risengrød will look watery until later into the cooking process when it will begin to thicken very quickly. Don’t worry – it will thicken into a creamy, dreamy mess! There’s really not much to it… Risengrød is very easy to make, the only thing that could go wrong is the burning! Add all ingredients to a pot. Simmer for about 30 minutes, STIRRING EVERY 5 MINUTES! As for the toppings, I went for something untraditional, but that actually works incredibly to combat the creaminess of the porridge and balance the sweet and sour flavours. I made a simple raspberry syrup, using just frozen raspberries and agave nectar. 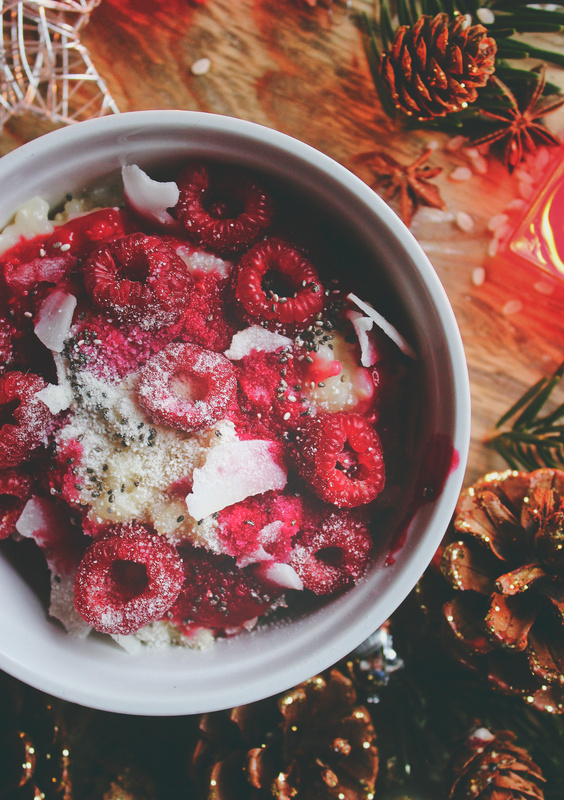 Then I poured that over top and added fresh raspberries, coconut flakes, chia seeds, and sifted coconut flour (to mimic powdered sugar for the photoshoot). But of course, you can also go the traditional route and serve it with cinnamon sugar, vegan butter, and (not traditional – I thought it was normal until my friends told me off – but my family’s special ingredient) mixed fruit squash. The squash helps to cool the risengrød and it adds some lovely fruity flavour. 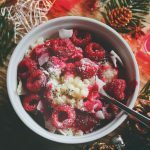 Risengrød is a treat for me, so I usually satisfy my porridge cravings with something else, something a bit healthier. 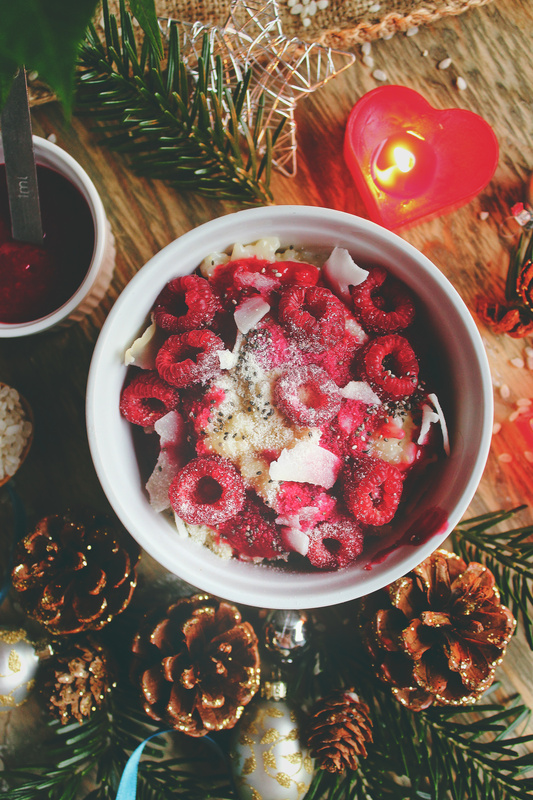 I have a few porridge recipes on my blog which you can check out! I probably won’t return to the blog until 2019, and if I do, it will most likely only be to post a list of vegan-friendly blogs which I’m currently compiling. This risengrød is quite a nice way to end 2018, don’t you think? I have a lot of ideas for this blog. I’m planning on buying a new WordPress theme to update its look as well as splurging on camera equipment and props to upgrade my photography game. 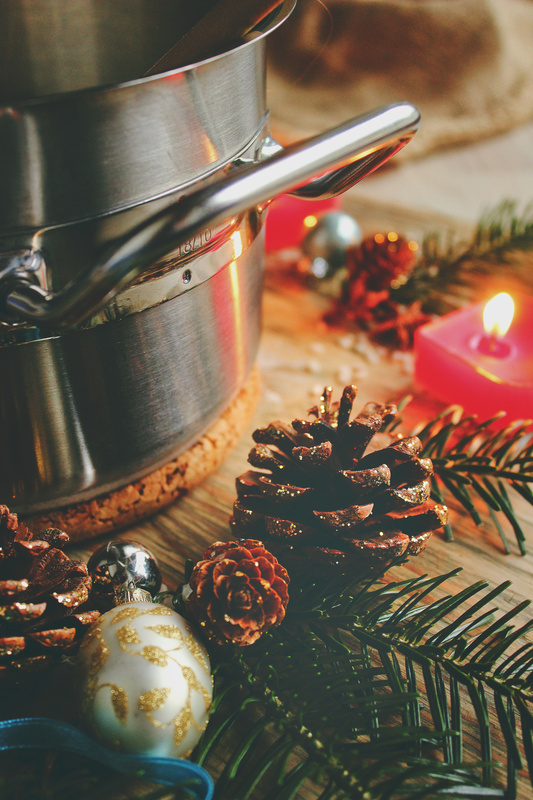 I’m excited to see what the new year will bring and to share more plant-based recipes with you! As always, I will be active on Instagram over the holidays, so you can follow me at @spirendeveganer if you want to see what I get up to and, most importantly, eat. Also, feel free to leave a comment below if you decide to try this recipe! Happy new year and merry Christmas to you all. Add the rice, salt, and milk to a medium pot over high heat and bring the milk to a boil, stirring frequently. 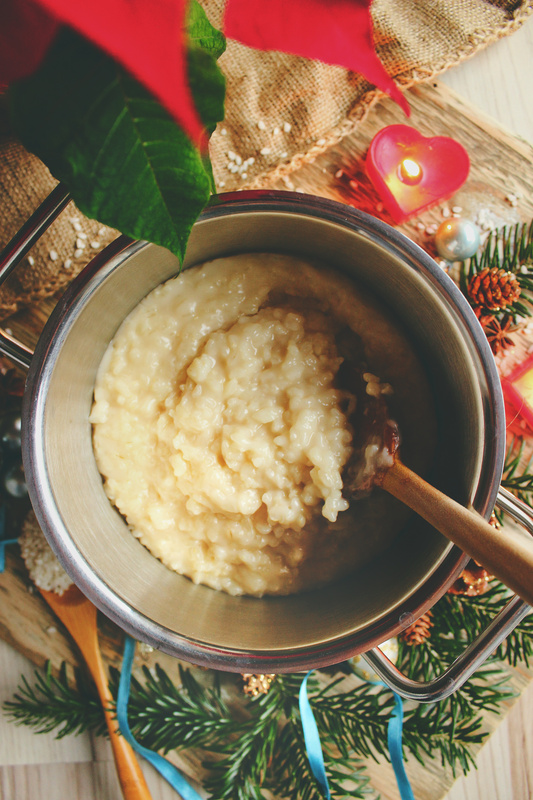 Once boiling, reduce the heat to low and let the risengrød simmer covered for 30 minutes, stirring every 5 minutes or so, or until the rice has absorbed all the milk. It should be very thick and creamy. 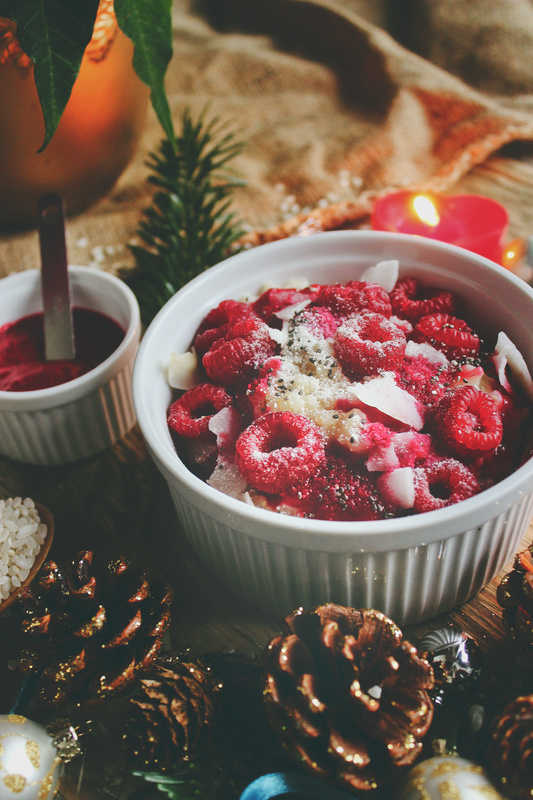 While the risengrød is simmering, you can make a raspberry syrup for serving, if you want to; add the frozen raspberries and agave nectar to a small pot over medium heat pot and cook until warm. Blend with either an immersion blender or in a regular blender until smooth. 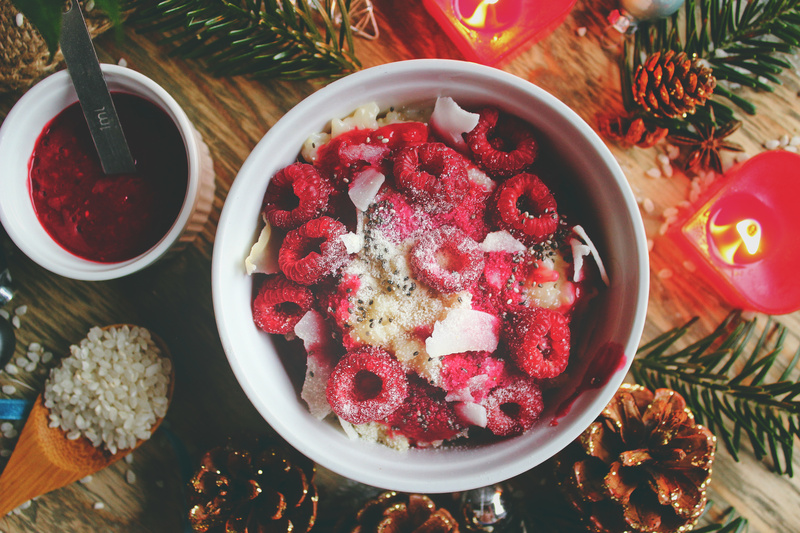 Serve the risengrød warm with raspberry syrup and, for example, fresh raspberries, coconut flakes, chia seeds, and coconut flour. Store leftovers in the fridge for up to 4 days. Either eat them cold or warm them on the stovetop or in the microwave for a few minutes, adding non-dairy milk to rehydrate if prefered. I wouldn't recommend substituting this rice for another kind since this rice is used for making risengrød traditionally, although I'm planning on experimenting with a healthier risengrød next Christmas. I also haven't tried making risengrød with any other plant milk, but I think it would work. If you try it with another kind, let me know how it turned out. I used about a tablespoon of agave nectar to sweeten the raspberry syrup.